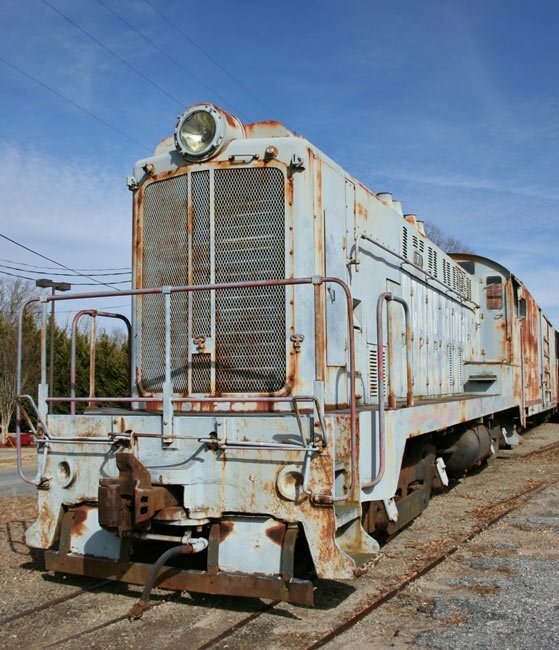 The T. Grady Welborn, pictured below, sits on the abandoned tracks of the old Pickens Railroad. The locomotive was the railway’s first diesel train and began running on the Pickens line in 1947. The 1945 Baldwin VO-660 was in service until the early 2000s. The Pickens Railroad began operations in 1898, running 8.9 miles from Pickens to Easley. The railway’s first locomotive derailed on its first run after local boys placed spikes on the tracks. Though there were no injuries, damage required the train to be replaced, causing the railroad company financial distress early on. The replacement train ran backwards to Easley and forwards to Pickens. Observant locals referred to the train as the “Pickens Doodle,” likening the movement to a “doodlebug.” Ownership of the railroad company changed hands over the years and included Singer Manufacturing, which owned a sewing machine cabinet plant along the Pickens rail line and purchased the railroad in the 1920s. In 1973 the railroad was purchased by the National Railway Utilization Company (NRUC), which also built box cars in Pickens. The box car business proved profitable for NRUC, as they were sold to rails nationally. However, by 1980, the boxcar industry declined due to new laws and deregulation. As a result, the Pickens Railroad also began to falter. The Chattahoochee Locomotive Company bought the railroad in the 1990s, but by 2013 the company had moved its operations to Anderson, abandoning the tracks in Pickens. Though located in Anderson, the railroad company is called the Pickens Railway. The route of the former railroad in Pickens is now a hiking trail connecting Easley to Pickens; it is called the Doodle Trail in honor of the railroad’s nickname. The T. Grady Welborn sits as a permanent display at the former Pickens Depot. My grandparent’s house on East Cedar Creek Road overlooked the main shed. As a kid in the late 60s and early 70s, it was the highlight of our visits for me to watch the happenings as there was always something going on. Lots of hammering, banging and general industrial noises. For a little kid, it was very exciting!